AUSTIN, TX--(Marketwired - Sep 21, 2016) - Edgile, a leading security and risk consulting services firm, today announced that it has expanded its leadership ranks with the addition of Paul Hewitt, a noted professional services security consultant who joins the Edgile West coast practice. In his role as Edgile managing director, Mr. Hewitt will be responsible for helping clients solve complex security challenges through the end-to-end delivery of strategic GRC, IAM, cloud and other solutions. Cybercrime is on the rise with average annual losses to companies worldwide in excess of $7.7 million in 2015, with studied companies losing up to $65 million, according to a report by the Ponemon Institute. As a result, Edgile has experienced increased demand for its cybersecurity consulting services and was recently ranked #1041 on the 2016 Inc. 5000 list of America's fastest growing private companies. Earlier this summer, Edgile hired security veteran Mike Peckenschneider to head the company's new Managed Security Services practice. "Over the last three years, Edgile has grown 100% each year as companies seek to strengthen their security posture to better protect against breaches," said Don Elledge, CEO of Edgile. "Our plan to expand Edgile's presence across the nation hinges on building a business culture that can attract the best talent and Paul's expertise in cybersecurity operations, business transformation, and large scale technology deployments make him a terrific addition to Edgile's highly respected team." Mr. Hewitt brings over 25 years of large enterprise technical and business transformation experience to Edgile. Formerly a partner with Accenture, he has built and led professional services teams with a focus on helping clients in the areas of networking, technical infrastructure and customer relationship management. 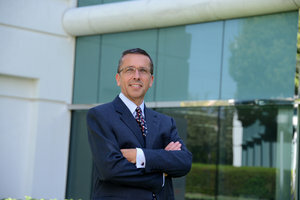 He joins Edgile from cybersecurity leader Symantec, where he was responsible for technology partnerships to enhance Symantec's Data Loss Prevention (DLP) capabilities as well as the integration of its Advanced Threat Protection (ATP) products with industry-leading SIEM and Service Management products.